Which way will the Monetary Policy Committee (MPC) veer in August? At the previous MPC meeting held in June 2018, there had been a unanimous vote for a 25 basis points (bps) hike in the repo rates. The Reserve Bank of India’s Monetary Policy Committee (MPC) will begin its two-day meet on Tuesday, July 31, and will make the key policy announcement on Wednesday, August 01. It may be recollected that at the previous MPC meeting held in June 2018, there had been a unanimous vote for a 25 basis points (bps) hike in the repo rates. 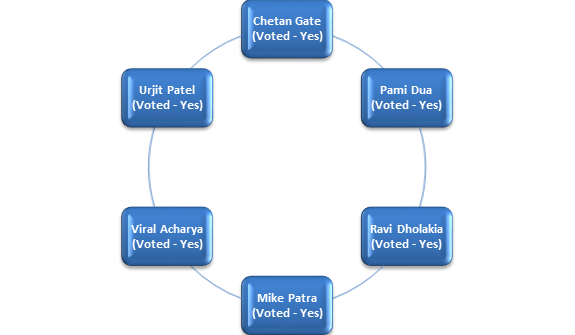 The gist of the vote is captured in the chart of MPC members below. The principal consideration for the unanimous hike in the June policy review was the sharp rise in inflation. Retail inflation, measured by the Consumer Price Index (CPI), had shot up sharply in the last few months to move closer to the 5%-mark. This was well beyond RBI’s comfort level. The two primary factors driving inflation, namely food and fuel, continued to be sticky. Also, a status quo on repo rates, combined with rising inflation, meant that the bond yields had gone up by over 140bps in the last one year. Add to that the sharp weakening of the INR to the 69/$ mark, the repo rate hike was the best option under the circumstances at the time. With inflation still high, what lies ahead in August? If inflation was the key driver for the 25bps rate hike in the June policy, then that problem has only compounded in August. If you look at the CPI inflation chart below, the rate of inflation has now officially touched 5%, with the maximum pressure coming from the crude oil space. Firstly, the price of Brent Crude is still hovering around $75/bbl. US stockpiles have been reducing at a rapid pace and oil demand is likely to peak in the coming year. Geopolitical uncertainty is another risk. Recently, Saudi Arabia suspended shipments of oil through the Bab-al-Mandeb strait in the Red Sea after two of its VLCC (Very Large Crude Carrier) tankers were allegedly attacked by Houthi rebels. The challenge is that nearly 4.8mn barrels of crude passes through the Bab-al-Mandeb strait each day and this could have a sharp impact on prices. With the Saudi Aramco IPO postponed, we can expect this oil uncertainty to stay longer. The second challenge pertains to food inflation. While the contribution of food inflation to the CPI basket is slightly lower, the impact of the assured MSP at 150% of the cost of production for Kharif crops will be inflationary. That picture will only be clear around September. So upside risks to inflation still exists. There is another element of risk which pertains to real interest rates coming down to 1.25%. The RBI has normally targeted a real rate of 1.75% and that also makes a case for a rate hike. A cursory look at the above chart clearly highlights that the low level of 1.25% real rate of interest could be the big justification that the MPC may adopt in its August policy. Considering the inflation trajectory, there is surely a case for a rate hike in August. If the MPC wants to hike the repo rates by 25bps in the August policy, the one big challenge will be growth. IIP growth, which is predominantly manufacturing, has shown green shoots of recovery but is yet to show any robust performance in terms of growth. The IIP growth chart below will give you a clearer picture. IIP growth at 8.5% in the month of November 2017 was more an exception than a rule. That was an outcome of the base effect due to demonetization in November 2016. From that point on, IIP growth has been on a consistent downturn. In fact, we are witnessing the base effect gradually wearing away from the IIP and actual industrial growth settling in the range of 3-4%. 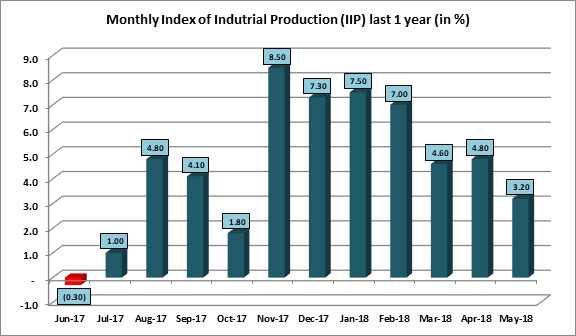 The big worry for the government and the RBI will be that the rate hike at this point of time should not have a dampening effect on IIP growth. Which way is the MPC likely to veer on August 01? At the end of the day, the MPC decision on rates will predicate on four critical factors. In a nutshell, it may be a close call for the MPC. In the interest of greater clarity on the macro situation, the MPC may choose to hold off till the October policy before taking a final call on another rate hike. But as usual, we will have to wait for the MPC meet to conclude on August 01 to know the correct answer!